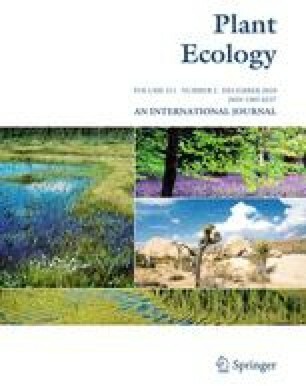 The fragmentation of mediterranean climate landscapes where fire is an important landscape process may lead to unsuitable fire regimes for many species, particularly rare species that occur as small isolated populations. We investigate the influence of fire interval on the persistence of population fragments of the endangered shrub Verticordia fimbrilepis Turcz. subsp. fimbrilepis in mediterranean climate south-west of Western Australia. We studied the population biology of the species over 5 years. While the species does recruit sporadically without fire this occurs only in years with above average rainfall, so fire seems to be the main environmental factor producing extensive recruitment. Transition matrix models were constructed to describe the shrub’s population dynamics. As the species is killed by fire and relies on a seed bank stimulated to germinate by smoke, stochastic simulations to compare different fire frequencies on population viability were completed. Extinction risk increased with increasing average fire interval. Initial population size was also important, with the lowest extinction risk in the largest population. For populations in small reserves where fire is generally excluded, inevitable plant senescence will lead to local extirpation unless fires of suitable frequency can be used to stimulate regeneration. While a suitable fire regime reduces extinction risk small populations are still prone to extinction due to stochastic influences, and this will be exacerbated by a projected drying climate increasing rates of adult mortality and also seedling mortality in the post-fire environment. Thanks to Jason Schmidberger, Richard Fairman, Rebecca Dillon for assistance with fieldwork. The Australian Bush Heritage fund for support. This study was conducted with the assistance of a grant from the Commonwealth of Australia Natural Heritage Trust (Endangered Species Program). See Tables 3, 4, 5, 6, 7, and 8.